It’s been a handful of days since Carrie and I took Shadow to the vet for the last time, and left without him. Although the hardest part (making the decision on Monday night to put him to sleep, the waiting on Tuesday, and finally taking him in) is over, now we’re in the longer process of getting used to life without him. There’s a void in the house and in our lives. He was often waiting at the threshold of my bedroom door in the morning for the first sound or movement that would clue him that I was awake. (Our bedroom was one of his “off-limits” rooms.) As soon as I would stir, he would be right at my bedside. (My bed IS right by the door, so it wasn’t TOO much of a violation!) As soon as he got his morning greeting he would go into the room next to our bedroom while I showered and dressed. Sometimes he would be right outside the bathroom door when I came out. Next came breakfast. If I were eating cereal, I’d usually eat standing up to save my sitting time for things that really require sitting. Whether I was standing or sitting, Shadow would be right at my feet… just in case I dropped something or decided to share something with him! After breakfast we would head for my sewing room/office where I read my Bible every morning. He’d be lying near my chair. If it were a washday, I’d be popping up and down changing loads, folding clothes, etc. If I was gone for too long, he would come to the room off the kitchen, “his” room, and lie there while I folded clothes. Then we’d be back to the sewing room/office. If I had ironing to do, as soon as I set up the ironing board, he would lie under it…on MY side! I’d always have to send him to the end of the board so I had a place to stand to do the ironing! If there were anyone around the house that didn’t belong, he would go off barking…a car or truck he didn’t recognize the sound of, a deliveryman, meter-reader, mailman, etc. One day, two Jehovah’s Witnesses came to the door. Shadow met them at the door with his ferocious, protective bark! The youngest “witness” was off to the end of the porch in the blink of an eye! He left his braver partner near the door to talk and offer me the usual booklet. I decided Shadow was a great way to filter out salespeople and solicitors who weren’t brave enough to endure the challenge! It wasn’t unusual for me to go to the door and find people in the middle of the porch waiting to talk to me! They didn’t dare stand too close to the door! I don’t always hear the doorbell or things going on around the house, so Shadow would “hear” for me. Lunch would find us in the kitchen with him again at my feet…just in case, you know! Sometimes I DO drop things or get full before I finish my sandwich. And he loves to share my cheese, apples and grapes! Good stuff! Healthy for both of us, right? Sometimes, right after lunch, I might sit and read for a while. If I sat too long, he would whine at me, not to go outside, but to come into “his” room and lie on the bed to read so that he could lie next to me! He was only allowed on one bed, Stephen’s, and only by invitation! When I’d had the maximum amount of sitting I could take for a time, I established the habit of lying on Stephen’s bed to read, so Shadow could lie next to me. He liked it! What can I say? We enjoyed each other’s company. I’d say, “You want to go to your room, right?” And off he’d go! We usually walked a mile a day. When it was really hot, we might walk before breakfast; otherwise we walked when I needed a break from sitting later in the morning. As soon as I put on my walking shoes or went for my key, he knew it was walking time and headed for the door! One morning while doing my exercises, I was lying on my back in a room where he could come, and before I knew it I had the legs and chest of a 75-pound dog across me. Try to do your exercises like that! He just had to be a part of everything! If Stephen was home in the evening, Shadow might stay with Stephen (he IS Stephen’s dog) or come in by me if I was working at my desk. If Stephen was NOT home, Shadow would stay with me for a while, but then whine until we’d go to his room to read! When our granddaughter arrived on the scene, Shadow began showing extreme jealousy whenever I was holding Alethea. He would whine at me until I’d pet him, or tried to get his body or head between her and me! He has shown no aggression toward her… just wants his share of the attention! What a dog! I find myself looking for him around every corner, expecting him to greet me every time I return home from somewhere and open the front door. He sure won my heart in his five years of life! Shadow was born in May 1996. 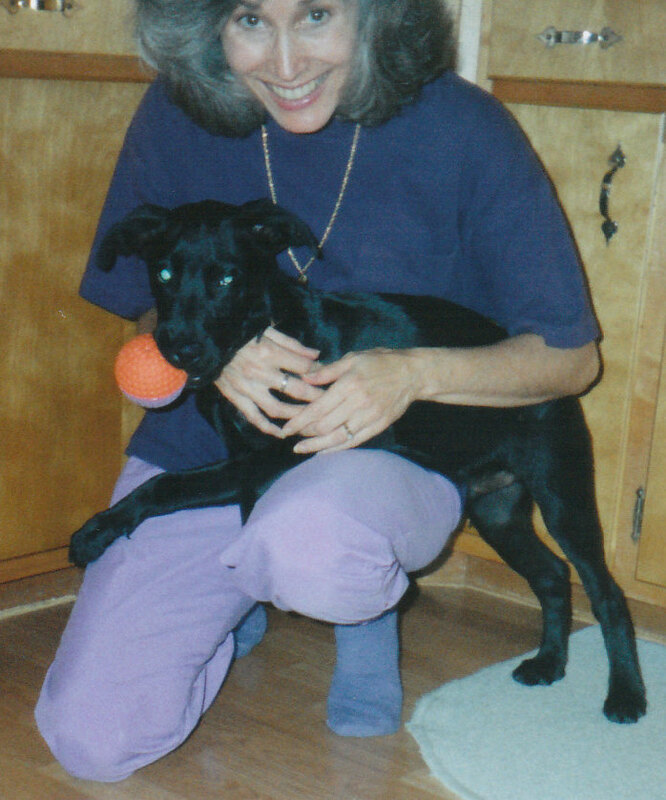 His mom was a sleek, slender black lab named Ebony. Shadow’s dad was supposed to be the large yellow lab who also lived on the premises. However, the neighbor dog had some plans of his own, and Ebony gave birth to a litter sired by the mutt next door. I got to pick Shadow out a handful of weeks after he was born, and then at about 6 weeks I brought him home. He whined all the way home, and continued to whine most of his life. Shadow was my first dog. Although I got him shortly before my actual birthday, he was my 20th birthday present. We had a German Shepherd-Collie Mix, Major, growing up, but he was Nathan’s dog, and being an outdoor dog he didn’t get as well integrated into the family as Shadow did. I had a cat, Sunshine, when I was very young, but Sunshine got out and was hit by a car while he was still a kitten. Shadow has been a part of my life for nearly 13 years. Although Shadow was a whiner (he whined when he wanted attention, he whined to go out, he whined to come in, he whined when he was excited, he whined when he was scared, he whined every inning when I was in the field the one time I took him with me to a softball game), he was a wonderful dog and a great companion. Shadow was a definite people-dog. Around other dogs, Shadow was timid and nervous. He would shy away from dogs 1/4 his size. But when anyone came to the house, Shadow was certain they were there to see him. He won the affection of even the non-dog lovers with his sweet personality. He loved to play tug-of-war, and would tire out anyone willing to take him on. Shadow also loved to go for rides, and he loved to swim. My first car was perfect for him, because he was able to put his front paws on the center console and stick his head out the sunroof, taking in the world everywhere we went. The very first time I introduced him to water, he wasn’t too sure about it. However, once I led him into the water to the point where his feet were no longer touching the bottom, he realized that he could float, and off he went. From then on, any time we went to the park he would start his whining as soon as we got into the park. One time I made the mistake of leaving my window down and Shadow jumped over me out the driver’s side window before I even got a chance to park the car. Last year Carrie and I took Shadow to the Indiana Dunes for the first time, and he got his first taste of Lake Michigan. As soon as he saw the water he was carrying on and straining at the leash to get in. His hips were already getting pretty bad from arthritis, and the waves would knock him down. However, he would get right back up and run out into the water again. He was bone tired the next two days, but he loved it. By about age 10, Shadow was getting arthritis in his hips and starting to have trouble getting up. Supplements and eventually a prescription anti-inflammatory helped quite a bit, but in the last few months his legs continued to get worse, and he was showing signs of problems in other areas of his body as well. His behavior starting changing too. Most of it, we just chalked up to growing old. A few weeks ago, he lost interest in his food. When he wouldn’t eat some of his past favorites like canned dog food, peanut butter, cottage cheese, etc., we knew something was wrong. The vet noticed a yellow tinge to the whites of his eyes and suspected liver failure. An ultra-sound showed what appeared to be two large tumors, one in his spleen and one in his liver. That was eight days ago, Monday March 2. In the past week, Carrie and I have been preparing ourselves for his approaching death, not knowing whether it would be days, weeks, or months. However, Shadow got worse each day, not eating, rarely getting up, struggling to walk, throwing up, and not being able to eliminate normally. We hoped that God would end his life naturally, sparing us the tough decision of putting him to sleep. However, there was nothing wrong with Shadow’s heart, head, or lungs; his heart kept right on ticking, and he kept right on breathing. By last night, it was finally clear to us that we couldn’t keep asking Shadow to lay around in pain, slowly starving, and struggling with the now very difficult task of getting in and out of the house. We prayed earnestly that God would allow Shadow to take his last breath that night, but God must have thought it better that we were with Shadow when that happened, rather than waking to find him dead. It was a tough phone call to the vet this morning, albeit a short one. I took the afternoon off work so both Carrie and I could spend Shadow’s last few hours with him. The vet and staff were kind, the injection painless, and the effect swift. Carrie and I are sad to see Shadow go, and we will miss him greatly. We know he made many friends throughout his life who will also miss him. However, we are grateful for the immense joy that he brought to our lives, and we are relieved that he is no longer suffering through a slow, painful demise. It’s raining today. It’s 9am, but it’s still dark out. That’s pretty much just what happens this time of year in Fort Wayne, but it’s fitting that today is Shadow’s last day. It feels like a funeral day.